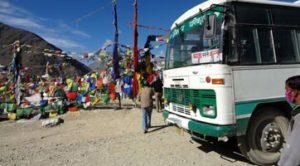 I remember spinning through the dripping forests as we climbed into the hills on the rickety bus from New Jalpaiguri to Darjeeling: I had a thought I had never had before. I thought how lovely it would be to have a baby and I could see the sweet brown eyes of this baby in my arms. 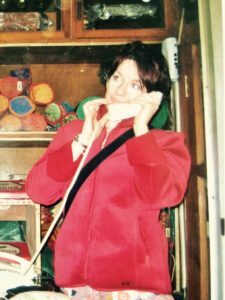 I was about as far from motherhood as I could get on my quest to acquire the Tibetan language, on my way to live with a dysfunctional Tibetan family who lived by the tea gardens in Darjeeling. But something deep inside me was stirring. Amala, (my Tibetan ‘Mother’) and I used to spend the early morning eating barley porridge with butter tea, looking out at the Mountain, before I went to my Tibetan lessons. I needed a mother. I wanted to be a good Tibetan girl, studying at the school in Darjeeling, attending weddings and fund raising events and school shows with my Amala, making offerings to the Buddhas and the Gods on the Mahakal hill with her. Yes, I wanted to be good. I wanted to forget the mad Tibetan lama with whom I had parted a few months before, who lived in the Dublin Mountains squatting a mobile home that in the end had burned to the ground, taking in its pyre his motorbike, his savings, his religious icons and scriptures. Gone, as he would go. Back to Kathmandu he went, and I thought I’d never see him again. 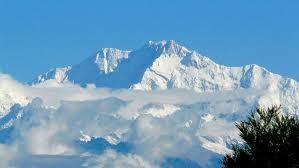 I was here, in Darjeeling, to forget him. Yet there was nothing but news from Kathmandu: King Gyanendra deposed, violent democracy riots on the streets. He was in fact just beyond the tea gardens- a few hours’ jeep ride away. But he would never know I was here, nestled in a shanty town in Darjeeling with my Tibetan family. My Amala scolded me when I came home late. My Pala (father) scolded me when my Tibetan dress was not folded correctly at the back. And what was that safety pin doing there? Would I not go to the tailor? Amala used to take me up the Mahakal Hill on Sundays to make offerings of barley flour and fruit at the temples. There had once been a Tibetan monastery on this hill but the British, irritated by the clatter of drums and horns from the Tibetan monastic ceremonies, had torn it down. 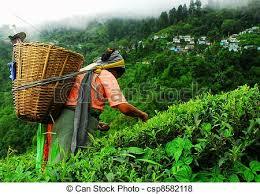 Darjeeling still had capsules of Britishness, having been the Britishers’ favourite hill station, being close to Kolkata and a cool reprieve from the deathly heat of the plains. It was more British than any place I had been in India and is home to St. Paul’s, the Eton of India where the teachers wear gowns and the boys play cricket on clipped lawns. Mahakal Hill, which had irritated the British so much, still has shrines and temples to Hindu and Buddhist deities, gods and demigods. It sometimes confused me, this melange of Hinduism and Buddhism. “Why are you making offerings at the Hindu shrine?” I would ask my Amala. “And why is that monk reading scriptures beneath her?” I asked her, in front of a large image of the ferocious black goddess Kali, from the Hindu pantheon. “This is Palden Lhamo.” said Amala, matter of factly, hiding her bag of bananas from the monkeys who were eyeing them up. She stuffed juniper twigs into the burning urn. Kali was Palden Lhamo, the great protectress of Tibet. Ganesha the elephant God was beloved by Buddhists and Hindus alike (He had after all helped the great Karmapa build his monastery in Sikkim). Sometimes you couldn’t even see the Mahakal Hill, there was so much fog. Come April, down came the fog covering Darljeeling’s gardens and rickety hotels. It used to disappoint me, in India, when I encountered rain, and fog. I used to want to run further up the mountains, to get away to some dry crevice in the Himalayas. Dampness frightened me. It reminded me of home. Dear, sodden Ireland. Darjeeling itself reminded me of Bray, my home town: the dry old cakes in the tea shops on Chowrastra could have been from Molloy’s café in Bray. How far I was from Bray, from my own dear Mother. Dear Mother, I have a Tibetan Amala, I told her in a letter. We drink butter tea and look out over Kachenjungma, we eat barley porridge together in the mornings and she picks crumbs from my morning dress, as mothers do. My own dear mother had, in my own mind, never fed me beyond when it was necessary in my growing years. She had, in her time, been a great cook of Provençal and obedient to the recipes of Maura Laverty, but as we grew, her interest waned. Mother, in her detached, heated double glazed house, with her shares, pensions, dividends and bonds would tell me, after I left home at 18, on every visit, that there was nothing to eat in the house. Nothing. In all the cupboards, in the depths of her freezer, nothing to feed a starving daughter. “Don’t expect to be fed.” she would say. Never. Ever. Never expect to be fed.Becoming a mother seemed impossible and yet this hidden clock inside me was ticking. It wasn’t that I decided that I would become a mother, but that I would allow my body to prepare to become one. The contraceptive pills had plagued me with fierce migraines during my relationship with Karma Lama, and at the end of each month I often found I could hardly see or stand with the blinding pain. I had blamed him, of course, for his relentless policing of my life and for his never ending dishonesty, for his wiliness, for his secret plans that always involved women and money. The shadow of him still seemed to be over me, and here in Darjeeling, being so close to the Nepalese border, I could still almost see him. As we watched the reports of escalating violence in Kathmandu after King Gyanendra had been deposed and the Maoists were thrusting for power, I wondered if Karma was alright. I wondered would I ever see him again. 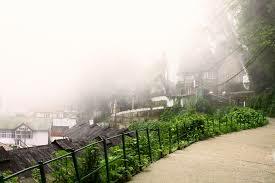 Darjeeling is hidden in fog from April to September. It is a fog that makes everything everywhere dull and mouldy. You would walk down the streets not knowing what ghosts moved through the fog with you. There is no escaping that unbearable shroud. The endless days of fog, with no beginning and no end. 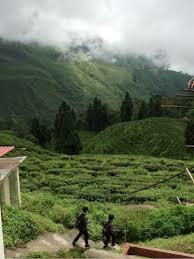 No Kachenjungma to peer at, no tea gardens to gaze over. Everything disappears. 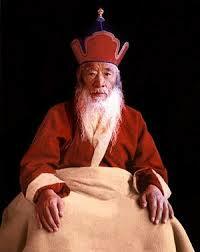 At this time, I discovered that Chatral Rinpoche, one of the greatest Tibetan yogis alive, lived nearby. 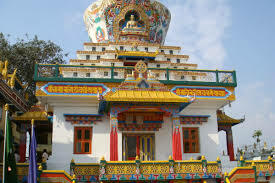 An American told me that the great Tibetan yogi was currently at his temple in Siliguri, near Darjeeling. He usually resided in Pharping, west of Kathmandu. I was suddenly amazed that this man even existed. Karma Lama had spoken of him so much, and had been his student in Pharping for many years. His picture used to hang over his bed in the mobile home: a gnome-like sage with a red woolen hat and yellow robes. I used to think that he saw everything in the mobile home, and beyond. Karma had told me that this was the greatest teacher he had ever known. He was a yogi, and Thomas Merton had admired him hugely. But after a psychotic westerner had tried to strangle the Rinpoche some years ago, audiences with this lama were almost impossible to acquire. “Can I meet him?” I asked the American. I resolved to go there and find him. I was just finishing my three month Tibetan course at the Manjushri centre in Darjeeling. I planned to leave before the celebrations for Saga Dawa (the day of the birth, death and enlightenment of the Buddha) began. It was a disappointment for my Amala, but she understood how much I wanted to meet Chatral Rinpoche. For some reason, I could not get him out of my head. I chose my best blue silk chuba with dragons that had been made by a drunken but very talented Muslim tailor, I packed my bags, and made promises to my Tibetan family that I would call them once I got back to Ireland. I took the rickety bus back down from Darjeeling to Siliguri, where, back on the plains, the heat was sweltering. 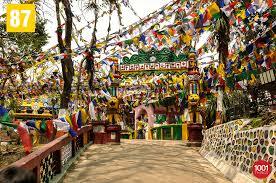 I found my way, with all my bags, to the Temple in Siliguri, down a dusty lane. I banged on the corrugated yellow gate. A surly monk answered. 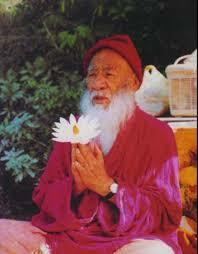 I told him in Tibetan that I wished to see Chatral Rinpoche. You can’t, he told me. Can I go to the temple? I asked. Go there, and wait, he said. I thought I would see him, then. I don’t know what came over me, but I began to prostrate like the most zealous Tibetan in that temple. I took out my mala beads and began to pray and recite purification mantras, as if I had committed every sort of sin that you could imagine. I begged the Buddhas to open the doors and get me an audience with this lama who I had decided would change the course of my life. And still, all I really knew of him was the colour photocopy of him that hung over Karma Lama’s bed. After a couple of hours of sitting under the shade of a fig tree, sweltering in my silk brocade dress, they called me into the dining area and told me to sit down and eat some dal and rice. 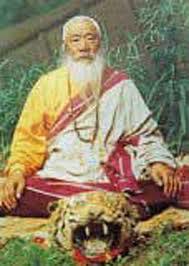 The surly monk who had opened the yellow gate came back, and handed me a red sung rab blessing cord and a little packet of men drup, medicinal pills blessed by Chatral Rinpoche himself. “He’s not well. You can’t meet him.” said the monk, sourly. So I left, sweltering in my blue dragon dress, and took the Rajdani Express to Delhi. Three years before, I had been told about a Tibetan man in Dublin who could teach me Tibetan language. He was from Mugum, a small kingdom near Mustang on the Nepali Tibetan border. When I met him one sunny August afternoon outside It’s a Bagel in Dunlaoire, he looked to me like a Tibetan wide-boy: he wore a black bomber jacket and shades. Good jeans and fancy trainers. He was giddy and flirtatious and altogether good fun. His name was Karma and I had no idea that he was a lama. Within twenty four hours we were a couple and the Tibetan lessons went out the window- yet that was the language we mostly communicated in. He brought me to his home in The Dublin Mountains, a mobile home that he had been allowed to squat, after the break up of his marriage to an Irish woman who lived down the road, with whom he had had a child. A daughter called Dolma. He wished now, he had said, he had a son. He was from a good lineage of lamas, and if he had a son, he would send him to a monastery school in India to become a lama. He pruned trees for a tree surgery company. He was agile, almost Mowgli-like in his boyishness. We fell in love. We did not know why, but we did. Does anyone ever know why, when it happens? We planned a great trip to Mount Kailash in Tibet, where his father’s people were from. He could get me Nepali papers, he said, that stated that I was his wife, and we could go over the Nepali border and into Tibet, guided by nomads to the most holy mountain in all of Asia- home of Shiva and Parvati and of the great guardian of Tibet, Palden Lhamo. 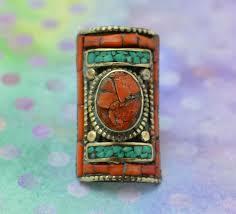 He gave me a Tibetan wedding ring which he pulled out of box of coins and amulets from an old Roses tin. It was a three- piece amber and silver ring, typical of those that were worn by Tibetan nomads. I lived like a lama’s consort in that mobile home, making dal and noodles and green tea, opening boxes sent from Nepal sent from his family: jars of exquisite honey from the mountains. Massage oil. Carpets. Incense. All the treasures of his homeland, which he tried to sell at markets around Dublin. Every Sunday, we went to my parent’s house for Sunday lunch. There was a time, yes, that my mother made Sunday lunch. It didn’t last long but Karma got the advantage of this passing trend. He would rattle on about his week among the trees and his philosophy of nature and love and life, none of which my father understood. “What in the name of God is he talking about?’ asked my father, again and again. Karma spoke English with Tibetan syntax. Plenty of words with no structure, and gusts of laughter that left my father irritated and confused. “Life is nature is lovely and natural I’m a natural kind of person you know what I mean?” was the kind of thing he used to say, which irritated my father to no end. What a Pity I had not chosen a man that could talk about the North, about Gerry Adam’s latest statement. What a pity this man knew nothing about US foreign policy. My mother never understood him either, nor why I was in a relationship with him. They were perplexed and perhaps a little concerned. Was I going to marry him? They never asked, but I knew they feared it. “And how do you manage, up there on that mountain?” asked my mother. Easy, I said. We practice together. He has given me scriptures to recite. We will go to Mount Kailash together. This was my idea of settling down. Finding Karma, I found a home in my own homelessness. Living in a mobile home in the Dublin Mountains made me feel I had a home. He was a nomad, I was a nomad. We were nomadic pilgrims and one day, we would go to Mount Kailash and all of our sins would be absolved and I would find out that really, really I was one of them. I was not from here at all. It was not long until I discovered that he was a deeply insecure young man who had no ability to trust. He had trouble with the truth and told many versions of it. He was so frightened of being abandoned that he compensated by flirting with every woman that he met: young, old and middle-aged. But perhaps especially middle-aged: they were the best sponsors, after all. He wheedled around those women who were potential sponsors, driven by his secret plan to build a temple in Nepal. Like all great lamas, he would have his own temple. Such were his jealousies that I was not allowed speak to waiters, tree surgeons, bank tillers, mechanics: men as a rule. Most forbidden were ex-boyfriends, especially the one that preceded him. Tom, from Donegal. A great curator, a man of wit who could, to my father’s delight, speak about Gerry Adams and US Foreign policy. Tom was an intellectual with three degrees. We continued our friendship long after we parted ways, we collaborated on Arts projects. He was the deepest threat to my Tibetan lama friend. Nobody should communicate with an ex, he said. Ever. You just shut the door, and that was that. And I began to wonder, would that be that between us, when it was over between us? Never, ever, ever again? Would we last the year? It was tumultuous. When I met Tom for a meeting about a future publication in his Arts Centre, I came back to a raging child in the mobile home: Karma overturned furniture, cursed at me and pushed me into a corner. I had a panic attack which he nursed me out of, ironically, with Medicine Buddha mantras and tea. He loved me, he said, but never ever meet that man again. Love. That what love was: keeping a rope around someone. Not trusting them. Tugging at the rope any time there was a sign of interest in anything other than you, the centre of a stagnant world. After a year, our relationship would be over. At least our living arrangement would be. In another way, this relationship would never be over. Karma had lost his mother at 14, when he was in training as a lama. His grandfather, Sherab Lama, had trained him in Buddhist practice and ritual use of the Tibetan religious gya ling (horn) and damaru (ritual drum ). He put Karma into a three year, three month, three day retreat at the age of twelve. Things fell apart, however, when his mother died in childbirth just as Karma had just turned fourteen. He was called out to conduct the burial rites. She had a sky burial- meaning that her body was chopped up into pieces, prayed over and offered to the vultures, as a gesture to the Buddhist edict of impermanence. There were prayer ceremonies for 49 days until she had been, according to the Tibetan Buddhist belief system, reborn. Meanwhile, they frantically tried to keep the family together. The village was in a frenzy: witch spirits were interfering with the peace. Rituals had to be conducted. Karma’s family’s fortune nosedived. There was, he said, no way to go back into the cave and finish that long and arduous retreat. Things were different now. 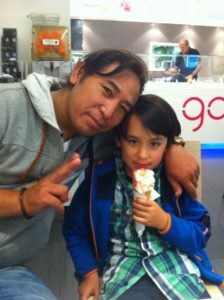 It was time for him to leave, to go to Kathmandu and finish his training there. Motherless Karma went to Kathmandu. That was Karma. 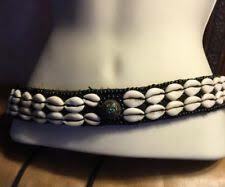 Once, he had given me a blue satin belt with sea shells sewn into it. “I don’t want a baby boy. If I have a baby boy, I’ll bring it to Kathmandu, and your aunties can mind it.” We laughed about this. I wasn’t ready. I had been taking oral contraception since I met him. How could he be speaking of children, already? Was this really a custom, giving your girlfriend a fertility belt? What a pity that Henry the VIII hadn’t known about those belts- at least two heads would have been saved. I was afraid of having a baby, and not knowing what to do with it. I was afraid because I was afraid of my own mother, and afraid of my own motherhood. 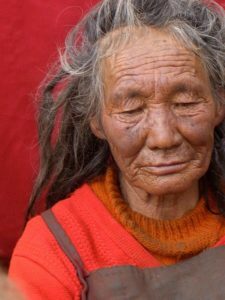 Studying Tibetan elevated me not only by several thousand feet- as I usually chose very high hill stations in the Himalayas to study, but from my own body. I could live in my head, and ignore my body. Sometimes, over those years of studying and researching, a little voice would come into my head: would it not be nice to be a mother? How would that be, to do what my mother and her mother and her mother and her mother and her mother had done since forever, until I came along? Mothering. It seemed important, but it also seemed very unreal. And very impractical, in the kind of life I led, researching and studying in the Himalayas, travel writing and never, ever having a home. A home was a place to rest after spurts of intensive traveling. It was a place to write. But there were no roots. I had no roots. I was comforted by Bruce Chatwin’s theory in Songlines, a book about the Dreamtime creation songs of the Aboriginals of Australia: that we are not, as Homo sapiens, made to settle, but to move. We are essentially nomadic and settling is unnatural to us. Settling, baking, having a filing system, building shelves, painting walls were not on my radar. 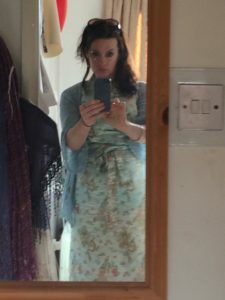 Finding a husband and having children hardly entered my mind. Then I met motherless Karma. Why did I keep meeting motherless men? Was I myself motherless, in some way? I had no mother who bombarded me with pies and cakes when I arrived home. I had a mother who was acutely aware of her own shortcomings, and who often had nothing in the fridge but sauces in jars that had gone beyond their sell-by date. I felt a hopeless lack, which is what drove me to find mothers in far-flung parts of the world. And men who had no mothers themselves, who sought mothers like me, a mother who felt she had no mother and could not be a mother to anyone. I did not dare to dream of motherhood. Not, at least, until I met Karma, several years later. Not until he gave me a blue satin belt with seashells sewn into it and a big Tibetan ring from his tin box of savings.